Readdle’s Spark email client has proven out quite popular amongst iOS users in terms of power. Today, the app has gained a much awaited update, expanding out the native user interface on the iPad. So experience Spark’s power on all of your iOS devices. 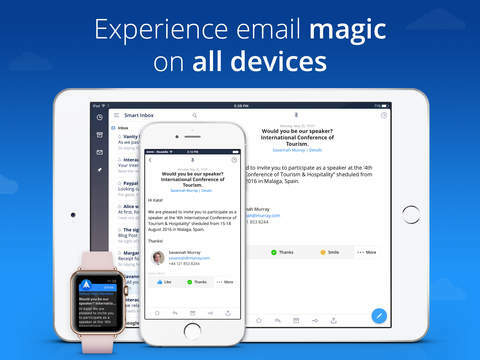 The update does not solely include iPad support, other improvements and refinements are also added for a smooth emailing experience. Some of the changes part of the update includes watchOS 2 support, up to nine new languages, smart search to find emails, quick replys, landscape mode on all iOS devices, the ability to sync accounts and settings across all of your iOS devices via iCloud and many more. 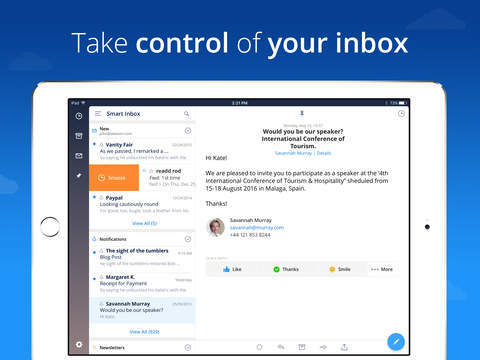 If you use the Spark email client on your iPhone, be sure to install it on your iPad as well. The rollout began this morning, so in case it does not appear in your local App Store, wait for it to propagate to your region. The thing that makes Spark great is its unique ”Smart Inbox” that shows you the most important unread messages first. There’s a reason Spark’s inbox is smart, it can identify emails as a notification, personal emails or a newsletter and operates it accordingly. So missing out on important emails is unlikely to be the case with Spark. Now that the update has extended Spark’s reach to the iPad, it will take full advantage of the big screen real estate. Whether it’s your 9.7-inch iPad Air or the 12.9-inch iPad Pro, the Spark email client has been designed to show you the most important email at a glance. The interactive controls in the Spark email app are fairly common with respect to other iOS email clients. This suggests that the app uses swipe gestures to archive or delete emails. It also includes a pinning feature, that kind of act as a bookmark for the tasks that needs to be completed as soon as possible. 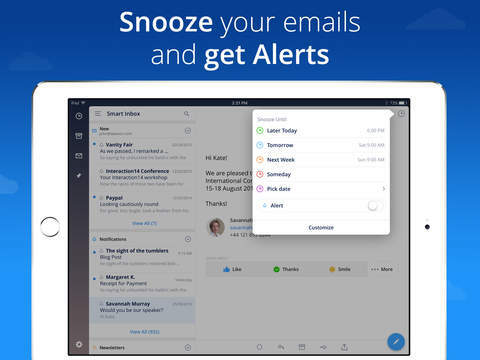 Moreover, the Snooze option allows you to put off emails, which can be viewed at a later day. The revamped design of the Spark email app allows it to take advantage of all screen sizes. There is also a Mac version of the app under development, which might take some time to make it to the public eye, according to Readdle. This is it for now, folks. Do you use the Spark email client on your iPhone? Would you give it a go on your iPad? Share your views in the comments.